Are you expecting a tax refund this year? 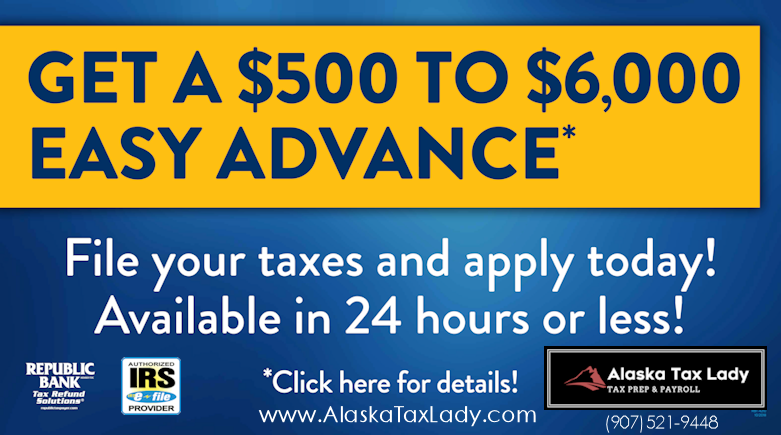 You may be eligible to apply for an EASY ADVANCE loan at Alaska Tax Lady℠ . An Easy Advance is a loan secured by your tax refund and is offered by Republic Bank & Trust Company, member FDIC, to eligible taxpayers. Loan is subject to underwriting and approval. It is not your actual tax refund. You can apply for $500 to $6000. Your loan amount options are based on your expected Federal refund less authorized fees. A Finance Charge will apply. Question: What is an Easy Advance? Answer: An Easy Advance (EA) is a loan secured by and paid back with your tax refund and is offered by Republic Bank & Trust Company, member FDIC, to eligible taxpayers. Loan amount options are based on your expected Federal refund less authorized fees. If approved for an EA, a Finance Charge will apply. Loan is subject to underwriting and approval. EA proceeds are typically available within 24 hours of IRS acceptance of tax return or within 24 hours for those filing before the IRS start date; however, if direct deposit is selected, it may take additional time for your financial institution to post the funds to your account. Question: How long does it take to be approved for an Easy Advance Loan? Answer: If approved, most loans are available in 24-48 business hours or less. Question: When is the Easy Advance Loan available? Answer: You can apply for an Easy Advance at Alaska Tax Lady℠ from January 2 to February 28, 2019.